Most of you know that the Bighorn River has experienced record water flows this spring. We reached a high of 14,000 cfs back in May —we’re at 9,500 now —but we’re almost to the point where the river can finally be drawn down and life can return to normal. Of course, as it regards Montana trout rivers, “normal” has a fluid definition, no pun intended. I constantly get this question from customers, “When is the best time to fish the Bighorn?” By “best time”, they envision low flows, crystal-clear water, minimal algae and aquatic grass, and rising fish. Oh yeah, there can’t be many people on the river either. My answer to checking off all the requirements is as follows: April 11th. April 11, 2018. People like specific answers. Please note that weather wasn’t one of the requirements. This year we’ve had problems meeting the ideal conditions requirements, yet we’ve also enjoyed outstanding fishing, especially if you can throw streamers. Emerald shiners have been pulled out of the big lake via the overflow spillway, and huge numbers of these baitfish have arrived in the river, many of them dead or crippled. The trout have welcomed the crippled shiners into their new ecosystem by ambushing and engulfing them at every turn. It’s common to see trout rolling, slashing, and leaping out of the water to gorge themselves on these little baitfish. “But I’m not a streamer fisherman”, you might say. “I never do well with them.” I can help you with that. First, you need to quit living in the past and buy the right fly line. I recommend the RIO Outbound Short or the Scientific Anglers Sonar Titan lines in a floating or intermediate-tip. This will take care of some of your casting inadequacies. These lines have, short, aggressive 30’ heads, and you can pound the bank with a minimum of false casting. Shooting line is easy. With a floating line you get more of that up-and-down, jigging action when you strip your streamer, plus you can pause your retrieve without having to worry about snagging bottom. When the water temps are optimal and the fish are grabby, floating lines are outstanding. Intermediate, clear-tip lines are also great because they give you a little bit of sink-rate, but not so much that you can’t fish it slowly when needed. I’m a big fan of an erratic retrieve, or popping the rod tip and stopping the retrieve now and then. Bighorn trout love to eat the fly when it’s falling or sitting still, kind of like most people prefer their snacks to be stationary when they reach for them. Floating or intermediate tips are perfect for this, but when water temps drop and you need to sweep the bottom, the OutBound Short I/S6 or the SA equivalent is surprisingly easy to cast for a line that gets down quickly. 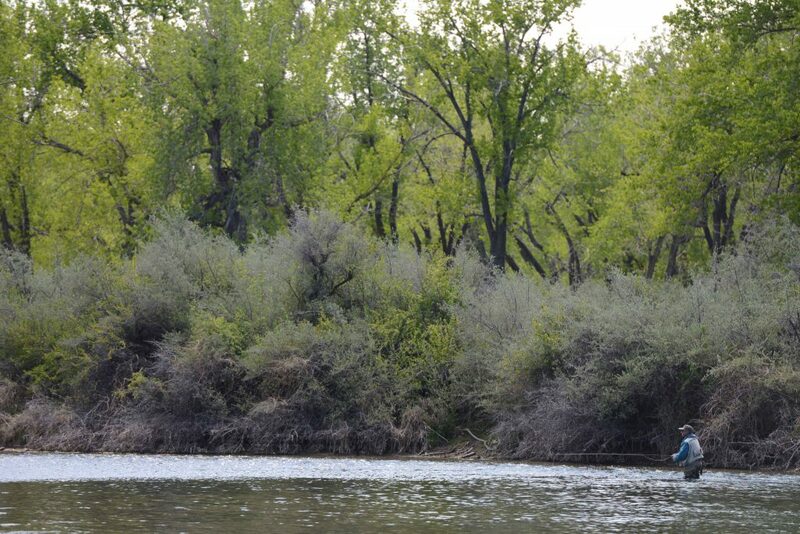 A challenging aspect of Bighorn River streamer fishing is the presence of algae and aquatic grass. “Challenging aspect” is fly shop speak for “this moss pisses me off!” There are methods to deal with algae’s grim reality, and you must master them to keep your fly clean enough to catch lots of fish. The “change-of-direction rip” is a favorite technique. Say you have snagged a sizeable, stringy piece of algae. Strip the fly close to the boat, lift the line to bring the fly close to the surface, then make an anemic roll cast. This roll cast shouldn’t bring the fly completely out of the water, rather it should roll the fly over so that it is now pointed away from you. Now, rip the fly out of the water back towards you with significant force. This sudden change of direction will usually tear the algae free. If the algae is small you can often knock it off with the standard, wind-mill slap we use for nymph fishing. Of course, if you hook a trophy, algae specimen, a manual release is still required, but most of the time you can avoid this. Be aware that streamer fishing and algae removal is not the domain of wimpy fly rods. A fast-action, seven-weight is ideal. Streamer fishing is all about efficiency. Good line management and weed removal techniques are essential, and those who cover the most water win. This year we’ve seen a number of trophy trout landed. I’m talking fish over five pounds. Some of these trout, like the shiners they relish, have made their way into the river via the overflow spillway. Some of these trout are killed or injured while descending the spillway, aka “the world’s most dangerous water slide,” but some survive. Just recently, Steve Hilbers and David Dill found a 29” brown trout that was dying. The fish was had a 19” girth and was estimated to weigh about 13 pounds. Other anglers have caught some very large, former, lake fish. Lake fish have a more silvery color cast than their river brethren, but as they spend time in the river, the browns develop the golden hue that Bighorn trout are known for, and the rainbows shed their chrome exterior. I predict that some lucky Bighorn River angler will catch a double-digit fish this summer. Despite the high flows, the black caddis hatch is now well underway, and anglers have reported good dry fly fishing in selected areas, but the water will need to come down further to ensure consistent surface action. Anglers are reporting morning trico spinner falls as well. All this is way early, but water temps have been in the 60-degree range for several weeks now, and warmer water temps accelerate the hatch schedule. Finally, I hate to say it, but I think that the incredible dry fly fishing for carp on Bighorn Lake is coming to an end, along with the cicada hatch. Don’t panic. There are still fish on the surface, but you’ll have to cover more water to find them. And you may have to fish a nymph dropper now and then. I hope everybody has a wonderful Fourth of July!